Have you experienced traffic destined through a Cisco ASA firewall disappears and you do not know if the traffic stops in the firewall or somewhere else? The solution is the capture feature. This feature was released in 6.2(1) and works in all firewalls modes; routed, transparent and multiple contexts. So, what does the capture feature / command do? The answer is simple... The capture feature can capture traffic on interfaces that can be analyzed in either the CLI or in Wireshark since it produces a pcap file. If you have never used Wireshark, it is a great tool for this type of analysis. Let’s test this; here we have a simple scenario with one computer connected on the inside of a firewall and a server connected to the outside of the firewall. Our problem is that we can’t ping the server from the host but it’s pingable from the ASA. 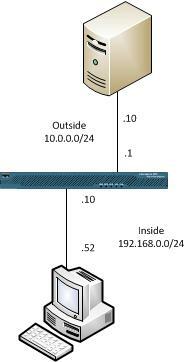 This scenario is built in GNS3 with routers posing as inside host and outside server. This was a simple example with very little traffic going through the ASA. When you do captures on live systems you will see a lot more traffic (it depends of course on the narrowness of the ACL) then it would be great to take the capture to Wireshark for analysis. One prerequisite is that you have ASDM installed and configured and after a capture you surf to https://ASA_IP/admin/capture/CAPTURE_NAME/pcap eg. https://192.168.0.1/admin/capture/capture1/pcap and download the file that your browser will prompt you about. I hope this has given you new ideas how to work when troubleshooting your firewall traffic, thank you for reading and good luck!